When exam date coming closer students face pressure the way to overcome this is revise the whole syllabus but as you know it's not easy to revise whole syllabus. That's why we provide CBSE Quick Revision Notes for class 11 Physics for your good preparation for exams. 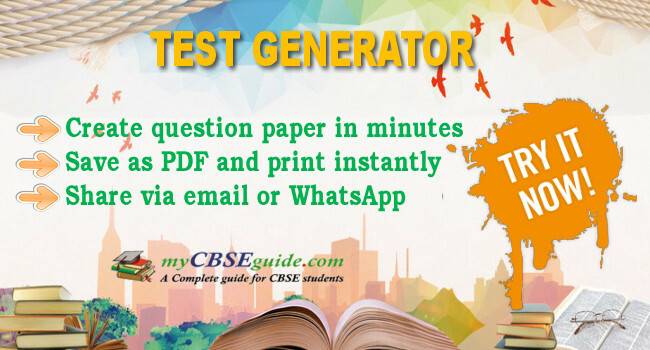 These notes are based on the latest syllabus and NCERT books and they are prepared by our expert and experienced teachers at myCBSEguide. We covered all the important topics in our notes that help you to prepare well for the exams and score well. And you can revise accordingly for your exams. If you want to make a career in these fields like Software Developer, Systems Analyst,Technical Specialist, Web Developer etc, Physics plays a major role. Download these chapter wise CBSE Revision Notes for class 11 Physics in our mycbseguide website and mobile app for free. Download CBSE Revision Notes for CBSE Class 11 Physics Units and Measurements Need for measurement: Units of measurement; systems of units; SI units, fundamental and derived units. Length, mass and time measurements; accuracy and precision of measuring instruments; errors in measurement; significant figures. Dimensions of physical quantities, dimensional analysis and its applications. Download CBSE Revision Notes for CBSE Class 11 Physics Motion in A Straight Line Frame of reference, Motion in a straight line: Position-time graph, speed and velocity. Elementary concepts of differentiation and integration for describing motion, uniform and nonuniform motion, average speed and instantaneous velocity, uniformly accelerated motion, velocity - time and position-time graphs. Relations for uniformly accelerated motion (graphical treatment). Download CBSE Revision Notes for CBSE Class 11 Physics Motion in A Plane Scalar and vector quantities; position and displacement vectors, general vectors and their notations; equality of vectors, multiplication of vectors by a real number; addition and subtraction of vectors, relative velocity, Unit vector; resolution of a vector in a plane, rectangular components, Scalar and Vector product of vectors. Motion in a plane, cases of uniform velocity and uniform acceleration-projectile motion, uniform circular motion. Download CBSE Revision Notes for CBSE Class 11 Physics Laws of Motion Intuitive concept of force, Inertia, Newton's first law of motion; momentum and Newton's second law of motion; impulse; Newton's third law of motion. Law of conservation of linear momentum and its applications. Equilibrium of concurrent forces, Static and kinetic friction, laws of friction, rolling friction, lubrication. Dynamics of uniform circular motion: Centripetal force, examples of circular motion (vehicle on a level circular road, vehicle on a banked road). 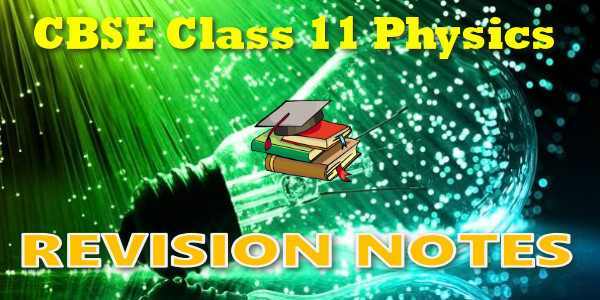 Download CBSE Revision Notes for CBSE Class 11 Physics Work Energy and Power Work done by a constant force and a variable force; kinetic energy, work-energy theorem, power. Notion of potential energy, potential energy of a spring, conservative forces: conservation of mechanical energy (kinetic and potential energies); non-conservative forces: motion in a vertical circle; elastic and inelastic collisions in one and two dimensions. Download CBSE Revision Notes for CBSE Class 11 Physics System of Particles and Rotational Motion Centre of mass of a two-particle system, momentum conservation and centre of mass motion. Centre of mass of a rigid body; centre of mass of a uniform rod. Moment of a force, torque, angular momentum, laws of conservation of angular momentum and its applications. Equilibrium of rigid bodies, rigid body rotation and equations of rotational motion, comparison of linear and rotational motions. Moment of inertia, radius of gyration, values of moments of inertia for simple geometrical objects (no derivation). Statement of parallel and perpendicular axes theorems and their applications. Download CBSE Revision Notes for CBSE Class 11 Physics Gravitation Kepler's laws of planetary motion, universal law of gravitation. Acceleration due to gravity and its variation with altitude and depth. Gravitational potential energy and gravitational potential, escape velocity, orbital velocity of a satellite, Geo-stationary satellites. 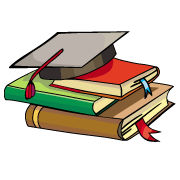 Download CBSE Revision Notes for CBSE Class 11 Physics Mechanical Properties of Solids Elastic behaviour, Stress-strain relationship, Hooke's law, Young's modulus, bulk modulus, shear modulus of rigidity, Poisson's ratio; elastic energy. Download CBSE Revision Notes for CBSE Class 11 Physics Mechanical Properties of Fluids Pressure due to a fluid column; Pascal's law and its applications (hydraulic lift and hydraulic brakes), effect of gravity on fluid pressure. Viscosity, Stokes' law, terminal velocity, streamline and turbulent flow, critical velocity, Bernoulli's theorem and its applications. Surface energy and surface tension, angle of contact, excess of pressure across a curved surface, application of surface tension ideas to drops, bubbles and capillary rise. Download CBSE Revision Notes for CBSE Class 11 Physics Thermal Properties of Matter Heat, temperature, thermal expansion; thermal expansion of solids, liquids and gases, anomalous expansion of water; specific heat capacity; Cp, Cv - calorimetry; change of state - latent heat capacity. Heat transfer-conduction, convection and radiation, thermal conductivity, qualitative ideas of Blackbody radiation, Wein's displacement Law, Stefan's law, Green house effect. Download CBSE Revision Notes for CBSE Class 11 Physics Thermodynamics Thermal equilibrium and definition of temperature (zeroth law of thermodynamics), heat, work and internal energy. First law of thermodynamics, isothermal and adiabatic processes. Second law of thermodynamics: reversible and irreversible processes, Heat engine and refrigerator. Download CBSE Revision Notes for CBSE Class 11 Physics Kinetic Theory Equation of state of a perfect gas, work done in compressing a gas. Kinetic theory of gases - assumptions, concept of pressure. Kinetic interpretation of temperature; rms speed of gas molecules; degrees of freedom, law of equi-partition of energy (statement only) and application to specific heat capacities of gases; concept of mean free path, Avogadro's number. Download CBSE Revision Notes for CBSE Class 11 Physics Oscillations and Waves Periodic motion - time period, frequency, displacement as a function of time, periodic functions. Simple harmonic motion (S.H.M) and its equation; phase; oscillations of a spring-restoring force and force constant; energy in S.H.M. Kinetic and potential energies; simple pendulum derivation of expression for its time period. Free, forced and damped oscillations (qualitative ideas only), resonance. Download CBSE Revision Notes for CBSE Class 11 Physics Waves Periodic motion - time period, frequency, displacement as a function of time, periodic functions. Simple harmonic motion (S.H.M) and its equation; phase; oscillations of a spring-restoring force and force constant; energy in S.H.M. Kinetic and potential energies; simple pendulum derivation of expression for its time period. Free, forced and damped oscillations (qualitative ideas only), resonance.